One of the benefits of living just north of Atlanta is the ability to be so close to the city, but just far enough away that we still have stars in the sky at night, and less traffic! We moved here just over 4 years ago, and we LOVE Roswell! 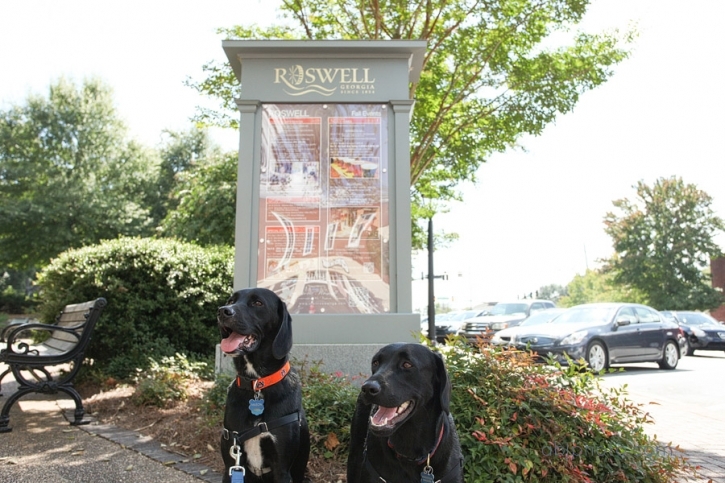 Roswell has great restaurants, outdoor living, and activities in just walking distance from our house! 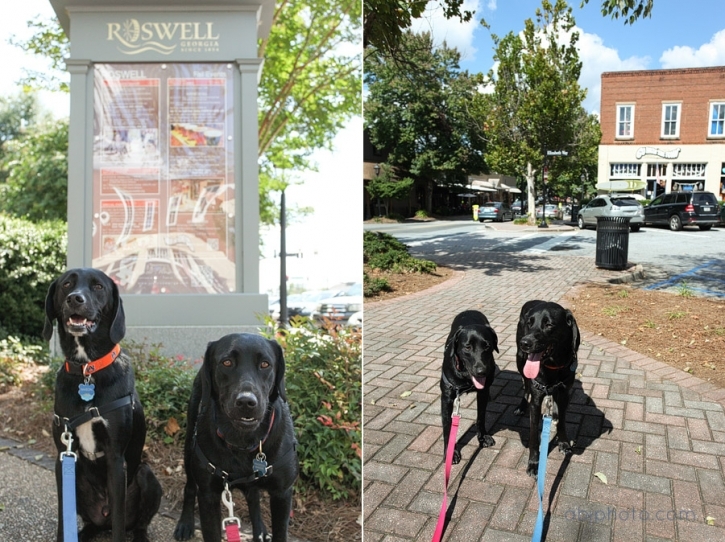 I got outdoors with Mason and Magnolia for National Walk Your Dog Week, yesterday and we checked out Historic Downtown Roswell. I was excited to capture some photos for DogVacay’s Dog Hometown Photo Campaign. This was the perfect day to showcase how much we love different activities in Roswell. 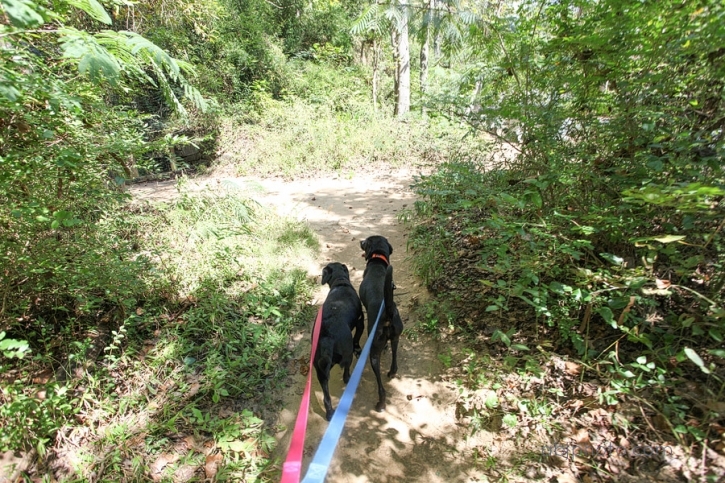 Another aspect of Roswell that we love is access to the water and hiking. Our dogs love to be outside and the LOVE the water! After a short cruise around downtown we headed for some shade and a fun spot to dip our toes. What a great day to be outside with my dogs! I would like to thank the folks at DogVacay.com for asking me to participate in their campaign during National Walk Your Dog Week! As a photographer, and someone who has based my business on providing images for my clients that they want to immediately display around their home, I am always searching for the right kind of products. Our photo books have really captured the essence of our portrait sessions, and I wanted to share them on the blog because they have become so popular among my clients. I have two styles of photo books. My first option is the number one seller. I fell in love with this hardcover book because I wanted one for myself! As I shared in my story, we lost Tess in 2012, and what I wanted was to have a book printed, something that I could display in my home, memories within reach…this coffee table style book was just what I was looking for! This hardcover book is 8.5 x 6.5 and comes custom made by ABJ Photography. The binding canvas colors range from basic khaki to beautiful blues or gray. Something that was very meaningful to me about this book was the ability to add pages with lines for writing inside the book. This option may not be for everyone, but for someone like me who likes to journal this means personal memories also included with the images. My second option is great as a brag book. This book is easy to carry in your purse to share with friends and family. This soft cover book comes in two sizes, 6.5 x 6.5 or 9 x 6.5. If you need a more economical option, but still want the ability to hold these images and memories in your hand, these are a great option! The soft cover books also have custom layouts created by me with your favorite images! Recently I was able to surprise a client with her own photo book of her golden retriever! This was a gift from a happy client and a cherished memory book her her fur-baby! Just before I was able to wrap it up, I snuck some photos with my iPhone. 🙂 I thought that book came out amazing, and from the tears in my clients eye, I know it meant a lot to her as well. If you are looking for a great way to display the images from your family portrait or dog portrait session in your home, consider the photo book! For more information when booking your photography session mention the photo book in your email. Fall is a great time to get in your holiday portrait session and this year you can include your pet! Book your photo session today by clicking on the CONTACT button above. Monday was packed with excitement, and I could hardly sleep the night before (mainly due to the early start time)! We had pet portrait day at Club K9 in Roswell, each dog was groomed and had their portrait done before each owner came by to pick them up. It was fun to photograph dogs both large and small all in one day! Special thanks to Khalvin from Tenacity for his help working with the dogs, he is a personal canine behaviorist who works with Club K9 and is based out of Atlanta. First up, with an early portrait time, were Latte and Bo! Latte is a beautiful Standard Poodle, and Bo is a beautiful Golden Retriever! Next up were Jake and Zach, adorable Yorkies! These two did a great job posing! Clementine was next, and she showed off all her tricks for us. This very smart girl turned out to be VERY photogenic! Lanston and his puppies were next! Langston belongs to Khalvin, and he is a beautiful, black, pure bread Pitbull. His pups are cute as a button, and gave out lots of free snuggles throughout the day, don’t you just LOVE puppies! And, puppy breath, and puppy everything! Meet Penny! Penny was not sure what to think of the camera at first, but this sweet girl won our hearts with her striking features. Edward and Bella were two cuties that came in the second half of the day. These two Pomeranians are sweet as can be! I love Golden Retrievers, our first family pet was a golden named Abby, and I will always have a soft spot for these kind dogs in my heart. Easton was fun to work with, and the only dog that I could get to hold a standing pose all day! The hardwood floors were tough to not slide on, but Easton was up for the challenge. That was one of my most favorite shots all day! Special thanks to all of the families who participated in our Club K9 Portrait day! Your dogs are beautiful and each have special qualities about them! I hope to see all of you again in the future, both at Club K9 and for our family and pet photography sessions! To find out more about my lifestyle pet and family portrait sessions please email me today! You can click on CONTACT at the top of the site to reach me. Or, to stay up to date on our next portrait day at Club K9 be sure to follow us on Facebook! We are dreaming up something SPOOKY for October! Debbie - Beautiful! I cannot wait to order my photos of Clementine. She had fun and can’t wait for the Halloween “photo shoot”. She thinks she is a star now! Thank you very much for sharing all the pics. One of the best parts of my job is getting to be involved with families who I love! The families at Milton High School, especially the women’s lacrosse team, have really supported ABJ Photography for the past few years. These girls are amazing! They are not just beautiful, but they are strong, athletic, and just all around great girls! This year I have been lucky enough to photograph the second generation of seniors. A few years ago I was fortunate enough to photograph Brooke’s sister, and it was so fun reconnecting with the family for this senior portrait photography session! For my senior portrait sessions I like to use two locations. One that may be the high school, and another that is local and allows for a different look during our time together. This allows for wardrobe changes, and the ability to showcase the season of life that they are in. With Brooke we visited a beautiful outdoor community space and also Milton High School. Did you know that the Milton women’s lacrosse team is ranked as one of the top teams in the nation? They sure are! These girls mean business, and it is so fun when we can get on the field for some portraits in their uniforms! Lacrosse was not as popular when I was in high school, but after knowing these ladies I sure do with I could go back in time and play!! Thank you so much Brooke and Bridget for a wonderful afternoon! Y’all are awesome, and best wishes in your college decision Brooke! It is not too late to book your high school senior portrait session! Get on the books today! Email me by using the CONTACT button above, thanks y’all! I need some senior pics taken of my son, and I know this is last minute…but I was wondering if you have any availability this Fri or Sat. We have a deadline approaching, so that’s why we need it soon. Just let me know. Special thanks to Roswell SNOBS on Facebook for leading me to the Spick Family! 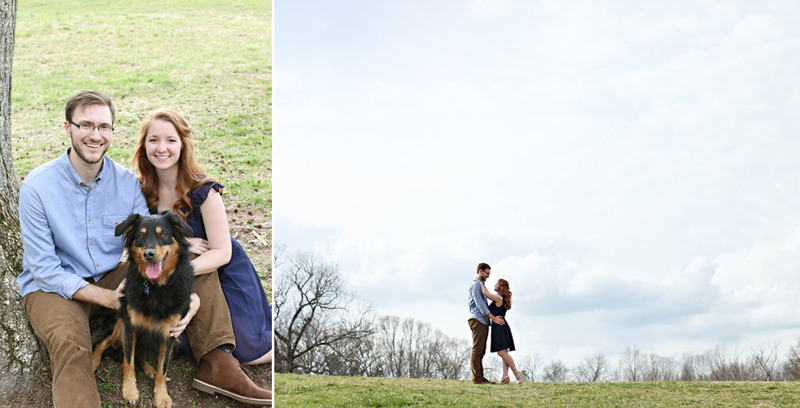 We had an amazing morning down on the Chattahoochee River for our family photography portrait session. Mornings like this make me want to get up and outside during these beautiful fall days! I was extra excited when I saw that they brought along their chocolate lab, added bonus! My thanks go out to the Spick Family for meeting me before little A’s first soccer practice! Congratulations on your new baby! And thank you so much for such a fun morning, it really started my weekend off with a smile! For more information on how you can book your family portrait or family and pet photography session please email me today by clicking on the CONTACT button above! You can view more amazing family portrait photography sessions in our gallery as well!